Franca Tantillo, founder of Berried Treasures, in Cooks Falls, NY. Franca Tantillo a native of Staten Island, was working as a registered nurse in Cooks Falls, New York, when she fell in love with the land around her home and planted her first acre of strawberries. That was 28 years ago. Today she is one of the 200 + family farmers in the region who raise livestock, produce honey, harvest vegetables, and grow fruits and flowers to sell at one of the 54 Greenmarkets in New York City. At Berried Treasures, Franca’s 40-acre farm in Cooks Falls, the energetic farmer rises at 3 a.m., fills her truck with plastic buckets of fingerling potatoes, pale lavender and white eggplant, and a constellation of cherry tomatoes and whisper small red ripe strawberries. Then she hops into her truck before 4 a.m. and drives 130 miles to the bustling Union Square Greenmarket. Berried Treasures at Union Square Greenmarket. Photo by Urban Food Guy. The women of the Greenmarket sell root vegetables and fruits, jams, honey, breads, herbs and mums, and, as the Christmas holidays approach, they sell wreaths, greens and holly tied with ribbon or twine. Many farmers are women over fifty who have an entrepreneurial yearning and talent and a genuine sense of connectedness to the land. Some women come from a long line of farmers or bakers and have been in the business for decades. Others, like Franca, have re-invented themselves. 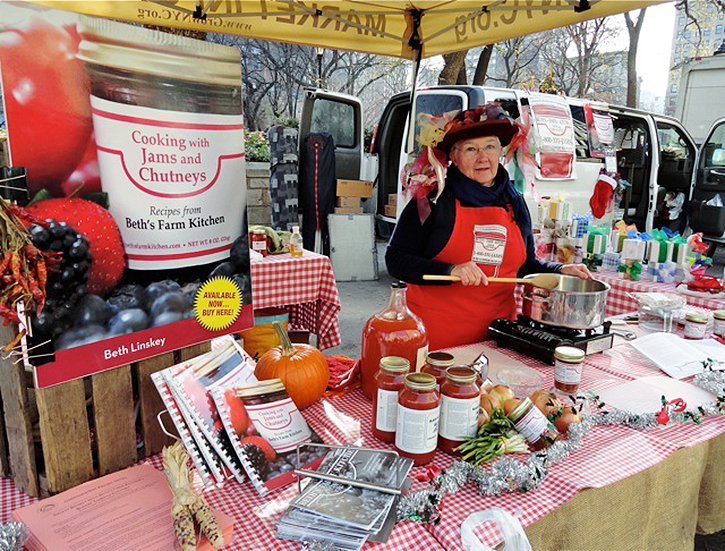 Beth Linskey, founder of Beth’s Farm Kitchen, in Stuyvesant Falls, NY, at the Union Square Greenmarket. Ole Mother Hubbert Cream Line Milk; Rose Hubbert of Back to the Future Farm. Rose Hubbert of Back to the Future Farm in Westtown, New York, agrees. 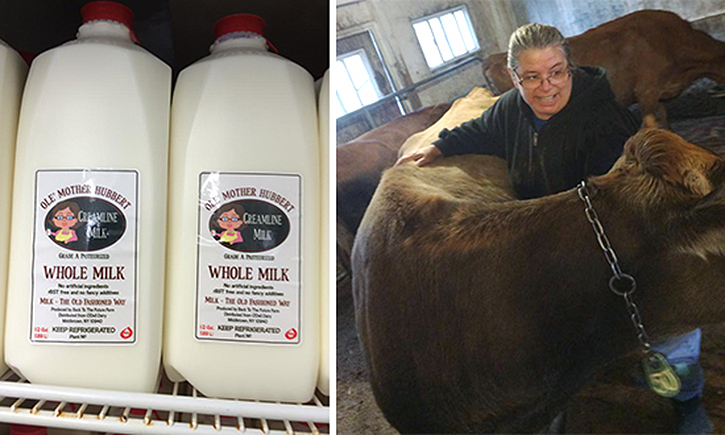 She and her husband owned auto repair shops and a car dealership before buying a herd of dairy cows. Then they teamed up with 21-year-old Michael O’Dell, who is the youngest dairy farmer in the state. They now sell a “cream” line of milk (it is natural and pasteurized, but not homogenized) as well as eggs and poultry. “Michael shared our work ethic. He comes from a long history of dairy farming and wanted to farm so we combined forces,” Rose says. “If we do not invest in young people who want to go on to agriculture as their profession and keep farming viable, it’s a profession that has absolutely no future.” As a group of curious middle school students sidle up to her stand to ask about her dairy products for a math/science project, Rose tells them about the wonder of farming and the very strenuous work involved. “It’s the hardest work I’ve ever done,” she says. “But also the most gratifying.” The students write this down in their notebooks and then Rose shares samples: bottles of chocolate milk! 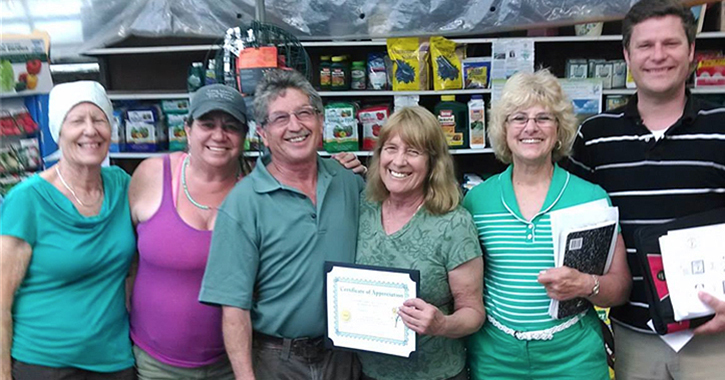 Joan Tifford, second from right, and her son David, center, co-own Fantastic Gardens in Patchogue, Long Island. The Fantastic Gardens stand at Union Square Greenmarket. 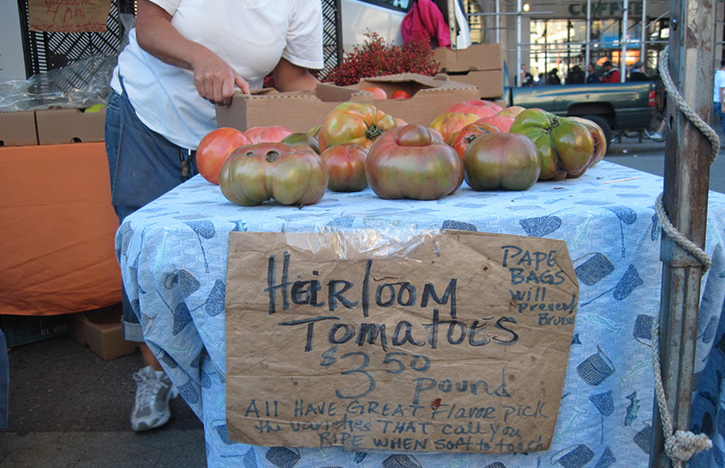 Photo: NYC Greenmarkets / Flickr. 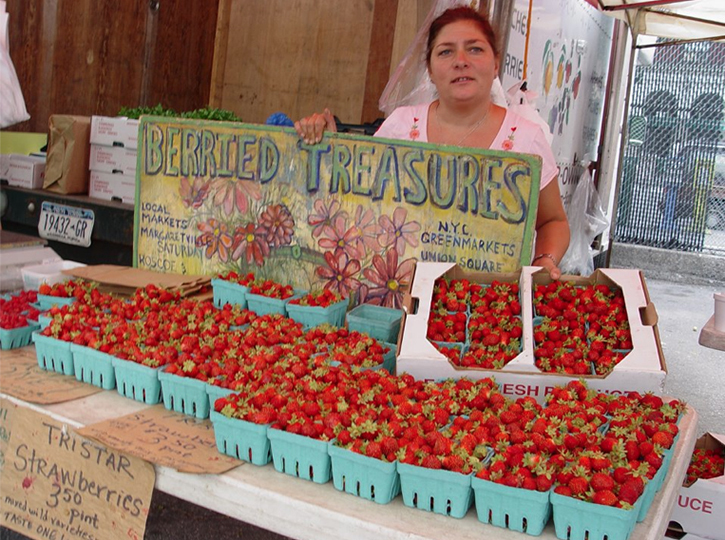 Greenmarkets abound in neighborhoods all over Manhattan and the boroughs. Many—especially in Manhattan, Brooklyn and Queens—are open year-round. The GrowNYC website is an excellent resource, featuring days and times, maps and which markets take debit/credit, EBT/food stamps and which markets also offer compost and textile recycling. Search for other Greenmarkets on the GrowNYC website. Staten Island: Ferry Whitehall Terminal Greenmarket inside the terminal building. Tuesdays and Fridays, 8 am to 7 pm, year-round. Features vegetables, fruit, baked goods, maple syrup and honey; all travel well on boats. Manhattan: Union Square Greenmarket, Union Square Park between 14th and 17th St., Monday, Wednesday, Friday, and Saturday 8 am to 6 pm year round. In peak season, 140 regional farmers, fishers, and bakers. 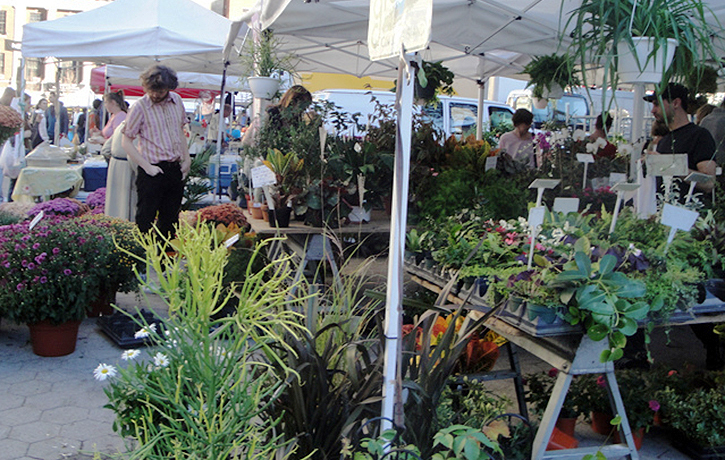 Manhattan: 79th Street Greenmarket, Columbus Ave. between 77th & 81st St., Sundays 9 am to 5 pm year-round. Features fresh fish, beef, goat, duck, ostrich and, this time of year, an abundance of root vegetables, preserves, cider, cheese and holiday greens. Manhattan: Dag Hammarskjold Plaza Greenmarket, 47th St. at Second Ave., Wednesdays 8 am to 4 pm, year-round, near the UN. Features veggies, breads, cheeses, 20 varieties of apples and more. Brooklyn: Borough Hall Greenmarket, Court and Montague St., Saturdays, Tuesdays and Thursdays 8 am to 5 pm year-round. Free-range eggs, grass-fed meat, dairy products and a bounty of fruits, veggies and flowers. Brooklyn: McCarren Park Greenmarket, Union Ave., Driggs and North 12th St., Saturdays 8 am to 3 pm year-round. Fresh milk, yogurt, juices, eggs, meats and baked goods. Perfect for impromptu picnic spread, even in chilly months. Rockaway Beach: Youthmarket, 58th St. and Beach Channel Dr., Saturdays 9 am to 3 pm, July 9 through Nov. 19. Provides fresh, affordable foods to a community still recovering from Hurricane Sandy. Local teens run stands to learn about community gardening, nutrition and running a small business. Jackie Fitzpatrick Hennessey has written for The New York Times, The Washington Post, and many other publications. She blogs at jackiefitzpatrickhennessey.blogspot.com and eachdaynewgrace@tumblr.com.